Why do Vim experts prefer buffers over tabs? I don't understand buffers. When I open 3 files on the same tab and close my window, I'm generally annoyed to find out next time I open one of those files that there are strange swap files lingering and giving me pesky messages. But time and time again I read that these things are the productivity nirvana I'm missing out on and that tabs were made for the plebeians to use. So I ask you, the Vim expert: what are the advantages of using buffers over tabs? I don't see how the difference could be profoundly different, but I would consider myself only at the beginner-intermediate level at operating Vim. Is :ls :b# really that much faster than gting around? I feel it must go deeper than this. As ZyX said on #vim, this question sounds like "Why do Vim experts prefer tasty over warm?". "Vim experts" don't prefer buffers over tabs: they use buffers as the file proxies they are and tab pages as the workspaces they are. Buffers and tab pages have different purposes so preferring one to the other makes no sense whatsoever. The issue with buffers and tabs is one of confusion, caused by a combination of independent facts. Most "modern" text editors and IDEs use a tab metaphor to represent loaded files. That metaphor acts as an information system — it shows the user what files are opened and their state — and as an interactive device — it allows the user to manipulate (reorder, select, close…) those opened files. Despite their many limitations, tabs are everywhere and people are used to them and expect them everywhere. 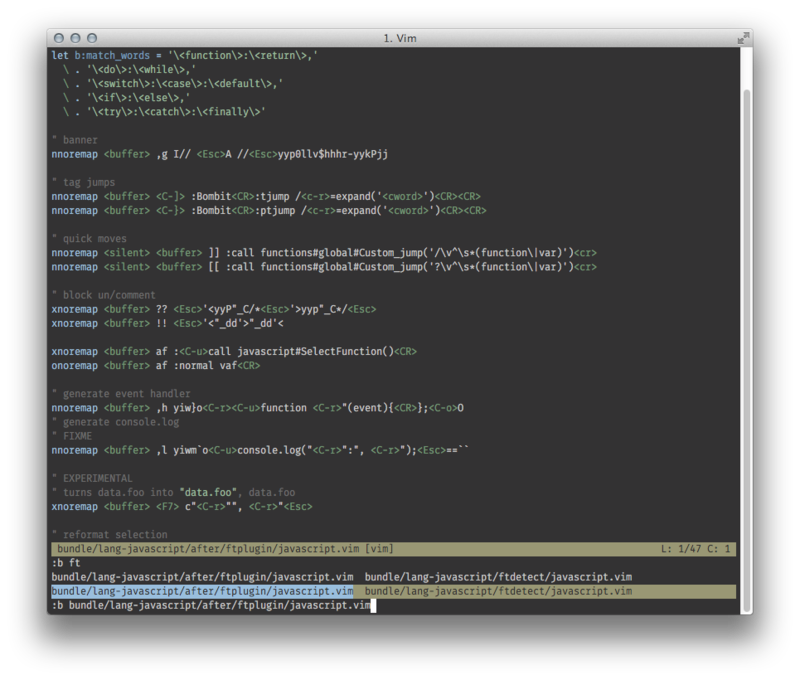 Vim introduced tab pages in 7.0 as a way for its users to create ad-hoc "workspaces". Nothing in their features, their specific options, their specific commands or their :help sections suggests that tab pages could or should be used as file proxies. Nothing except the name and the appearance of "tab pages", of course, which leads to much confusion. Without :set hidden, which is disabled by default and not very easy to find, Vim makes it impossible to switch to another buffer without writing the current one or abandoning its changes. New users, unaware of that option, have no choice but to turn to heavy windows use or to the closest "tab-like" feature they can find: tab pages. "Tab page" is an unfortunate name choice for that feature, especially in an era dominated by the idea that reading documentation is a waste of time. 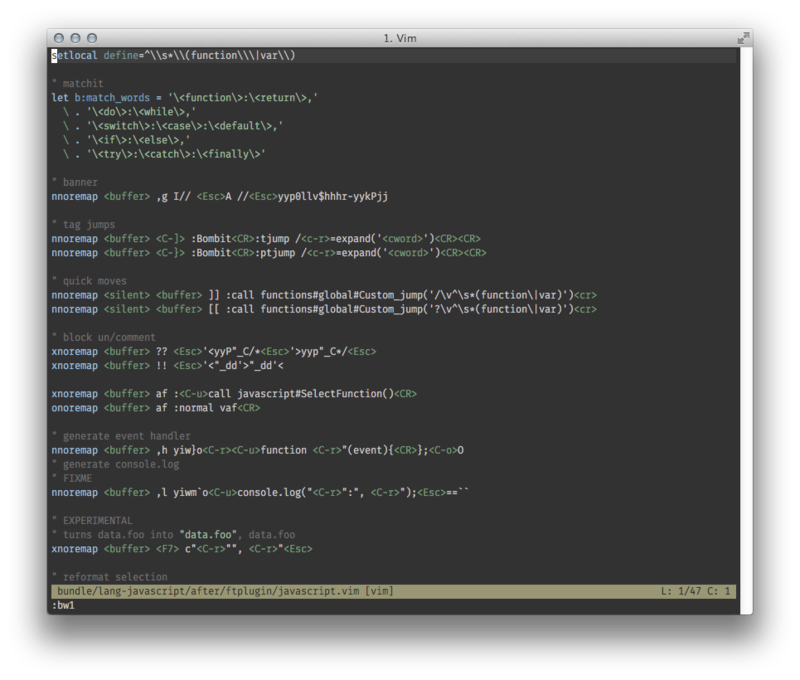 In Vim, tab pages are an abstraction built on top of windows, themselves an abstraction built on top of buffers. Each new level adds useful features but restricts your workflow. With a buffer-based workflow, the files you are working with are distributed along a single dimension. You can cycle through your buffers, you can access a specific buffer by typing part of its name (with completion) or its number, you can alternate between buffers, you can target them pretty easily. There's basically no friction. Buffers are Vim's file-proxies. If you think in terms of files, you think in terms of buffers. With a window-based workflow, your "files" are both distributed along the same single "virtual" dimension as they would if you only used buffers and along two other "physical" dimensions. But the cartesian spaces in which those dimensions are found are almost completely separated: moving to another buffer still means "moving to another file" but moving to another window doesn't. The buffer that corresponds to the desired file may be displayed in that window but it could also be displayed in another one, maybe in another tab page, or not at all. With windows, navigating between open files either becomes too complex or too simplistic, even with 'switchbuf' and :sb. Mostly because you are forced to use two sets of commands for what is essentially the same thing: accessing a buffer. Windows have their use, as described below, but they don't have what it takes to replace buffers in anybody's workflow. Windows are not designed as file-proxies and can't be made into ones: they are "containers" or "viewports" designed to offer you a view into a buffer. No more, no less. With a tab-based workflow, you essentially try to mimic the user experience you are used to from your previous editor while completely ignoring the very nature of Vim's tab pages. If we forget for a moment that this strategy is generally very unproductive, it is also impossible, just like with windows, to force Vim to adhere to that "one file = one tab" paradigm without losing a lot of flexibility. And yeah, my tabline is clobbered with only 8 tabs, imagine if I had 20! Tab pages are "containers" or "viewports" designed to contain one or more windows, themselves also "containers" designed to contain buffers. when they need to work for a while on a separate part of the project without messing with their current view, "Vim experts" load a brand new tab page. I used to keep every buffer in a separate tab, but I grew tired of constantly gt and gT-ing around everywhere. I also felt that buffers were too difficult to manage. tpope's Unimpaired plugin. Convenient mappings for flying through your buffers (among others). Realize I need to open another file. Use :e for that as well. If I want to toggle between this buffer and the currently open buffer I will use :sp or :vsp to open it in a separate window. Repeat until I've got the 3-5 files that I will be switching between using the techniques in the above bulleted list to fly between your buffers. If I want to "start over" with my buffers, just close Vim and re-open. I felt that after a week or so of forcing these new patterns, it became much easier to visualize which buffers I had open, and how to get to any one of them in only a few automatic strokes. The downside of tabs is that you can only see the contents of one at a time. So if you use them like in a browser, you're losing out on viewing multiple buffers side by side, or even viewing separate parts of the same file in splits. Therefore, many recommend to use tabs only to segregate different workspaces (e.g. have one for a Java project, another for a todo list, a third to hack on a script on the side). The problems you describe make it appear that you're using Vim wrong. Either have (mostly) a single, dedicated instance. Then, buffers that become hidden will simply "reappear" if you re-edit them (and you can now use the buffer list to recall them), and there won't be swap file messages. Or, use separate Vim instances per project / file / edit session, but then make it a habit to fully :quit each instance when you're done with the file. Another tip, when using the buffer name as the argument to :buffer, you don't have to specify entire names. However, if more than one buffer matches the given argument, the buffers won't be switched. Any fragment of the buffer name can be used to match. For example, if you have the buffers request_manager.java and queue_manager.java then :buffer que or :b que matches both of them, but will switch to queue_manager.java as it matches at the beginning. I have ) and ( mapped to "go to next tab" and "go to previous tab" respectively. tn opens a new tab. I also make use of tabm to help keep things organized. I use Vim sessions for groups of files relating to the current story/bug I'm working on, usually done by category. These sessions get overwritten during the course of the process. 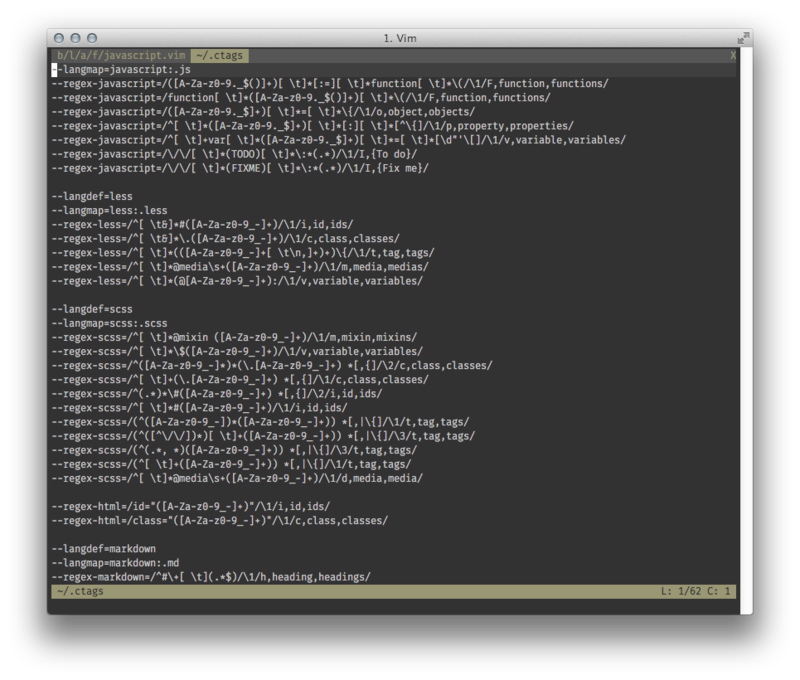 I have yet to find anything better than Ctrl-P, but it does take a bit to process all the files for finding. That way you can cycle forward/backward through them in normal mode via Tab/ShiftTab. I load "selected" buffers as tabs to quickly (TAB/S-TAB) toggle between them. The framework of workspaces fits here as for me buffers VS tabs is mostly the visibility thing. I can pop important/work files in windows and tabs and hide the ones I don't currently need to utilize in the background on the fly without having to remember paths or take time to search and load them up again once the need arises. This allows for handling several tasks or projects in one VIM session, I guess this used to be important in low-memory machines but is also good for concentrating all editing tasks under one application frame. I also have buffer shifting shortcuts set to Ctrl-Right/Left so I can quickly shift through various buffers as well. Bottom line, one can only split up to some windows for his uses as much as screen estate goes, but one can hold multiple windows settings in several tabs thus expanding one's workspace and improving workflow allowing the convenient division of complicated tasks revolving more than one file. For the swap files, you can tell VIM to keep all of them in one folder of your designation. For this use :set directory. By design, tabs are meant to display bufferes in creative ways. 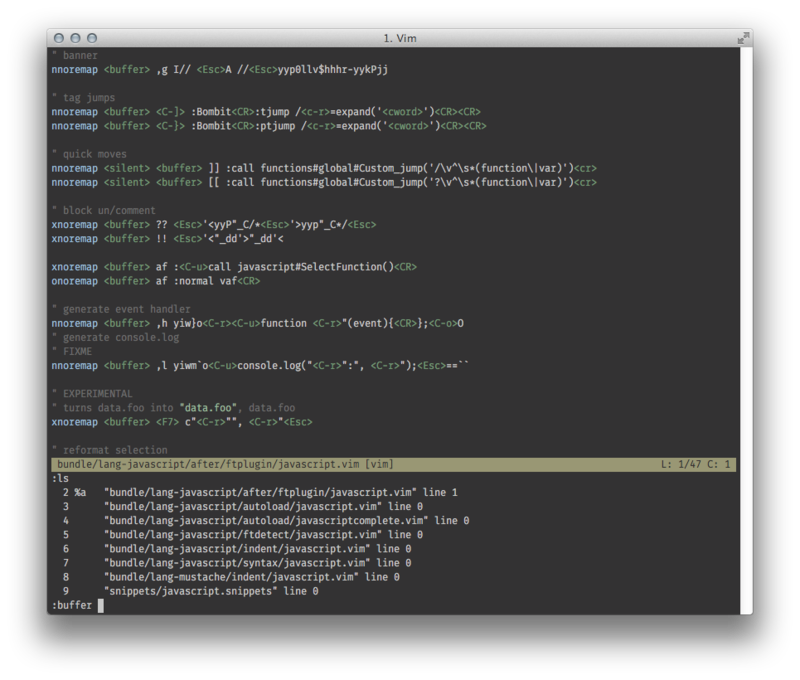 Per my experience with vim-airline, the tabline will show very few relevant information when I create a new tab. Worst still, I no longer have any idea of what are the buffers that are hidden. It has been a wonderful rediscovery of this magic plugin, which should have been staying in my Vim configuration for a good number of years as well. 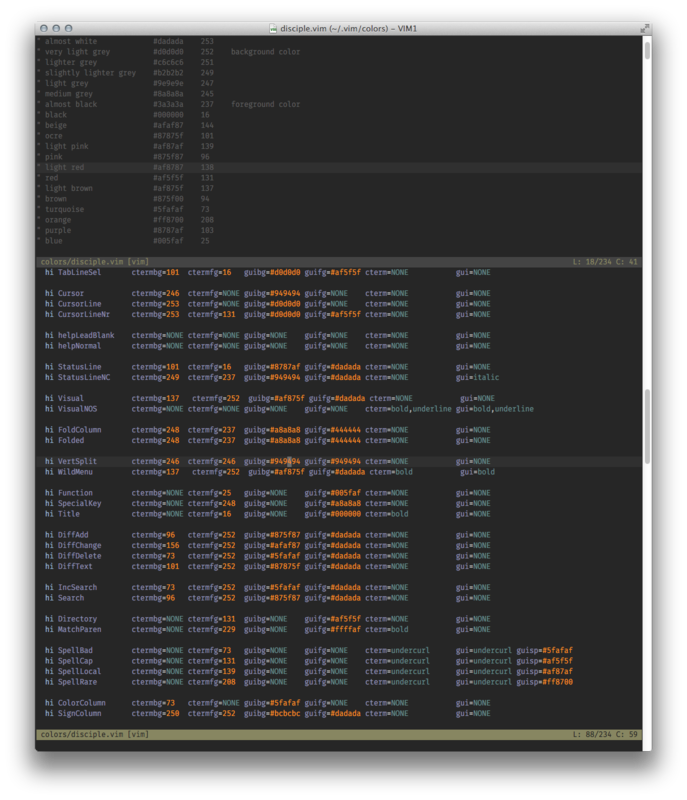 While I would continue to look for some thing that also displays all the hidden buffers, TabMan is my superman when it comes to having a bird's eye view of how buffers were arranged across different tabs. Not the answer you're looking for? Browse other questions tagged vim buffer vi or ask your own question. How to show tab close button in GVIM? How do I make vim open all files matching a pattern in different tabs? 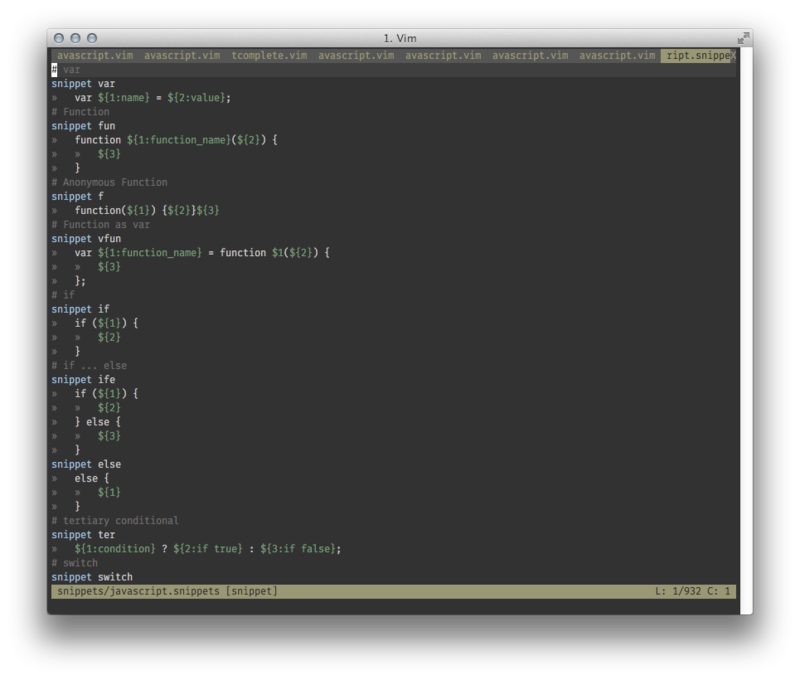 Vim NERDTree. How to prohibit duplicate files in tabs? Switch to a particular tab by typing its name in Vim? How to let Vim tabs NOT display full file path and only display relative folders when there are files with same names open? How to move around buffers in vim?